WINWARD HO. Sail For Joy could bring a smile to new trainer Fabian Habib’s face tomorrow by winning Race 7 at the Vaal, a MR 80 Handicap over 1400m. The win would be Habib’s third in his career as a trainer. Fabian Habib has had a fair start to his training career. He only sent out his first runner in March this year and it took until May for him to have his first winner. The horse was Sail For Joy and ironically, it was on the same day Chesney van Zyl saddled his first winner in his own name as a trainer. Habib has had his second winner and his record, for a young trainer, is quite respectable. He has saddled 58 runners for two wins, five seconds, three thirds and two fourths. That means 20.69% of his runners have earned for their owners. 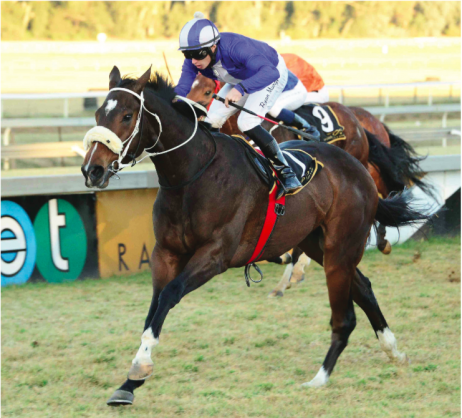 Tomorrow Sail For Joy returns to the Vaal to compete in a MR 80 Handicap over 1400m and he need only run the same sort of race to notch up his second successive winner. That race was also a MR 80 Handicap but the field was slightly stronger than he will be meeting in this event. This four-year-old son of Argonaut only received a 1kg penalty for that victory and will carry 61.5kg whereas last time he had 60.5kg on his back. Ryan Munger has had a long association with this gelding and will be back aboard. Randall Simons has risen to occasion since taking over the role of De Kock’s first choice jockey and the combination have been churning out the winners. Jackman seems to be a better performer over 1600m but has placed in four of his five runs over the distance. What makes him an interesting runner is that he is Piere Strydom’s only ride on the day. He also runs well for apprentice Dennis Schwarz who has not finished further back on him than a 2.80-length fifth – behind Sail For Joy, interestingly. Shortstop is just 1kg better off so is unlikely to reverse the places but should go closer.